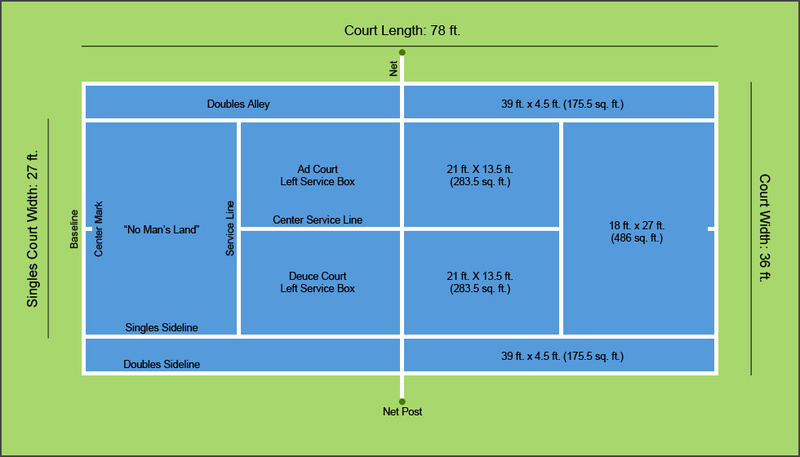 Tennis courts measure 78 ft. x 36 ft. or 2,808 sq. ft., however the full area of the court is only used for doubles matches. The singles court measures 78 ft. x 27 ft. or 2,106 sq. ft.
Here’s a diagram that you can use as a point of reference as we cover each part of the court. The baseline runs parallel to the net and defines the furthest boundary or back of the court from the net on both sides. It’s typically where you will hit most of your groundstrokes (forehands and backhands) and the approximate location you’ll return serves from. Any shot (other than the serve) that lands beyond this line is considered out. The center mark divides the baseline in half and runs perpendicular to the net. It’s defines the point you cannot cross when hitting a serve in both the deuce and ad court. In general, it’s a great point of reference when playing tennis as you’ll find coaches telling you to always return to the center of the baseline after you hit a groundstroke. The service line runs parallel to the net and marks the halfway point between the net and the baseline. It also marks the end of the service boxes, however unlike the baseline it only extends to the singles sidelines. Any serve that lands beyond this line in the court is considered out. The center service line runs perpendicular to the net and meets the service line to create two equal sized service boxes. The singles sidelines also run perpendicular to the net and define the side boundaries of the court for singles matches. A few feet outside of the singles side lines are the doubles sidelines. These sidelines run perpendicular to the net and define the side boundaries of the court for doubles matches. The two equal sized boxes created by the center service are the left and right service boxes. The space created between the singles and doubles sidelines is called the doubles alley. If you’re new to tennis you’ll probably hear someone yell, “Get out of no mans land,” more times than you care for. This is the largest box on the court that falls between the service line and the baseline. Typically you want to avoid standing in this area because you’ll be too close to hit a groundstroke and to far to hit a solid volley. The net splits a tennis court in half and runs directly through the middle of the court. A white strap measuring 2 inches wide in the center of the net is used to control the height and is faceted to the ground. Tennis nets should be mesh that is small enough so that a tennis ball can’t pass through, and the top of the net should have a white band measuring 2-2.5 inches in depth. How do you choose your tennis shoes? Selecting a pair of tennis shoes that best fits a player is essential to his or her performance on the court. A typical game of tennis involves sudden starts and stops, and rapid side to side movements that will impact your feet and ankles. 1. The ideal pair of tennis shoes should fit your feet like a glove. They should neither be too tight nor too loose. They should allow for comfortable movement while providing adequate cushioning on the inner sole. Unlike buying leather shoes, tennis shoes do not need to be ‘broken in’. The shoes should feel ready to play from the moment you try it on in the shop. Tennis shoes tend to feel snugger on your feet, but you want to make sure it’s not so tight it causes chafing. 2. Most popular tennis shoes have herringbone style outer soles that help with traction on the court. While this is suitable for games on hard, synthetic grass and clay courts, it works especially well for clay. The narrow treading found on those patterns help grip the floor while preventing loose grains on the surface from entering the sole and smoothening it out. Using the right sole for the right court surface can prolong the life of your tennis shoes, give the right amount of traction and prevent damage to the court. 3. Ensure that your new pair of tennis shoes gives your feet enough lateral support. This starts from the cushioning of the inner sole to compensate for the arch on your heel and moves to the heel counter and the heel collar. Your feet should feel low in the shoe with the sides supporting your ankles and the back of your feet. For baseline players, this is crucial to assist the unavoidable vigorous side to side motion.